In appreciation of her exceptional and unforgettable contribution to the scientific promotion of Medical Biochemistry, and in response to an initiative by her closest co-workers and friends, at a meeting of the Executive Board of the Society of Medical Biochemists of Serbia held on 12 April 2012, the Society of Medical Biochemists of Serbia (SMBS) founded the ‘Magistra Milica Marković’ Fund in memory of Magistra Milica Marković, a great scholar, one of the best Serbian Magisters of Biochemistry, timeless biochemist and hard-working professional in the practice of Clinical Biochemistry. 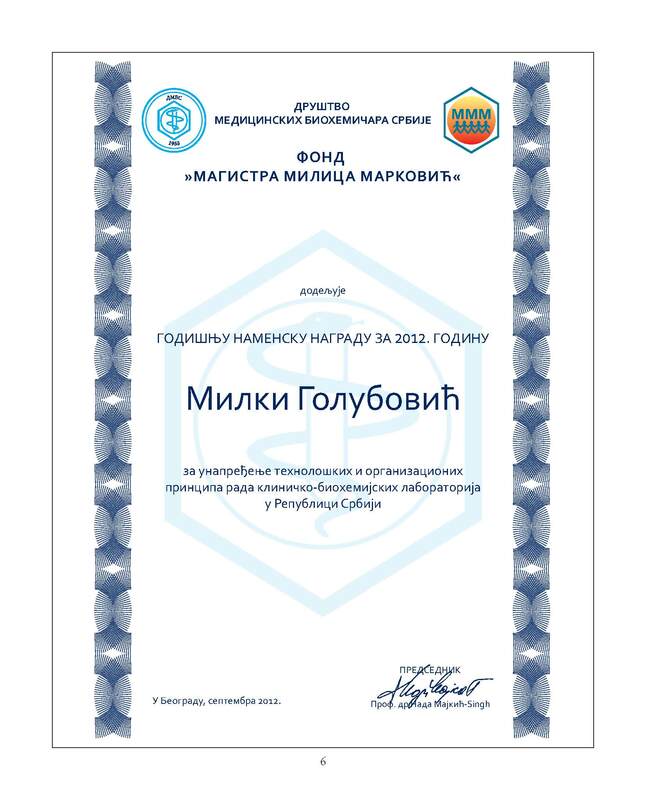 Magistra Milica Marković graduated from the Faculty of Pharmacy in Belgrade and specialized in Medical Biochemistry. 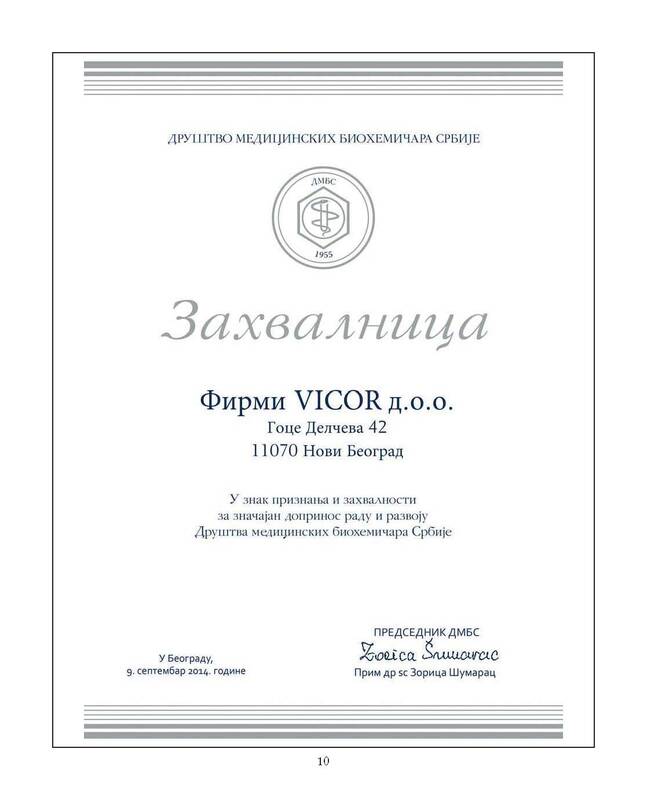 After completing her studies, she worked in the Biochemistry Laboratory of the Second Clinic of Surgery, and then in the laboratory of the Central Specialist Polyclinic Belgrade and the Clinical Biochemistry Laboratory of the Clinic of Neurosurgery. Since the founding of the joint medical services of the University Clinical Centre, i.e. 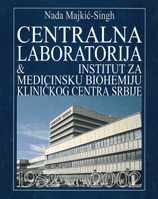 the Institute of Medical Biochemistry of the Clinical Center of Serbia, she was the Deputy Director of the Institute. She attended further specialization courses in Medical Biochemistry in London, at the National Hospital University of London, in laboratories for chemical pathology, clinical neurochemistry and medications. She published over 60 professional and scientific papers both in the country and abroad. 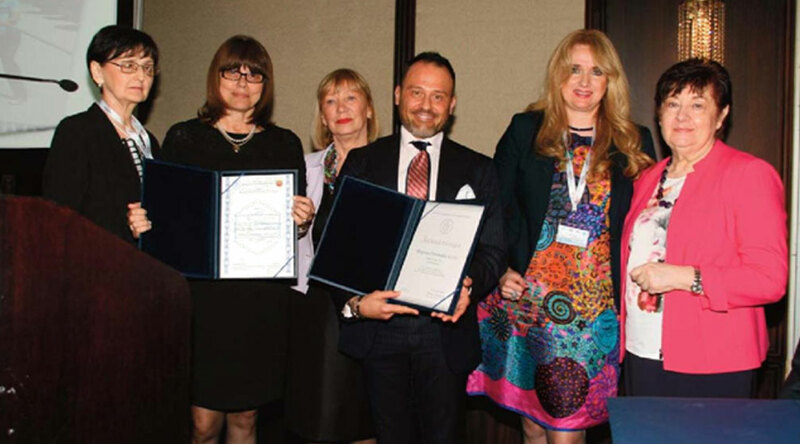 She took part in several scientific research projects of the Clinic of Neurosurgery and Institute of Physiology of the Faculty of Medicine in Belgrade. She created an original numeric system for the nomenclature of medical biochemistry and worked on a document concerned with the standardization of work norms, organization and categorization of clinical biochemistry laboratories and other problems related to the field of Medical Biochemistry. 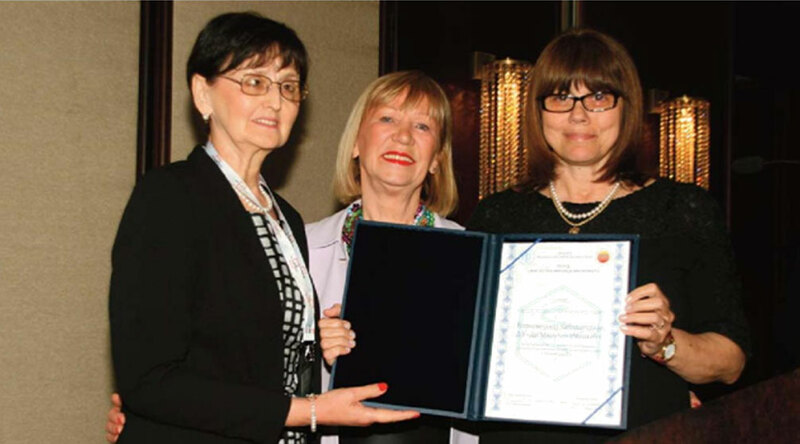 She was an active member of the Section for Medical Biochemistry of the Pharmaceutical Society of Serbia and the Society of Medical Biochemists of Yugoslavia. 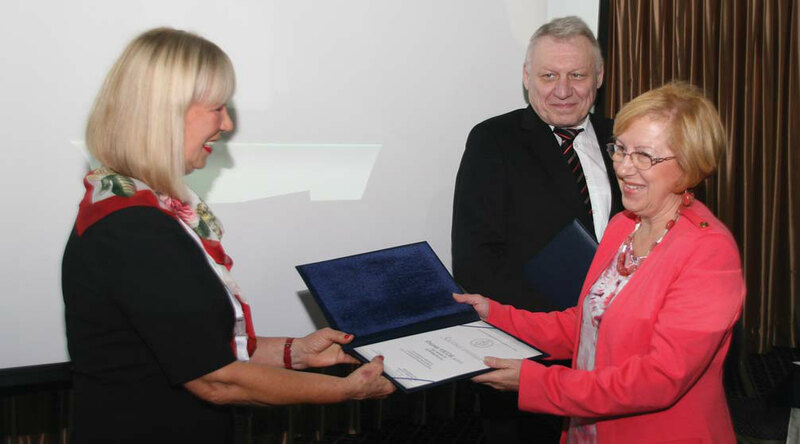 As rewards for her outstanding contribution, she received Diplomas of the Federation of Pharmaceutical Societies of Yugoslavia and the Society of Medical Biochemists of Serbia. 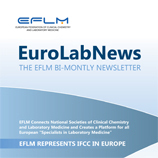 With her enthusiasm, selfless and great commitment, without holding back, she was the one who introduced and promoted the work and organization of laboratory diagnostics in practice. Her love, fascination and interaction with the laboratory never ceased, and her relationship with the laboratory took many forms. She introduced numerous novlties in the work technology: procedures and actions that define the processes of receiving biological material and issuing results of laboratory testing through the application of a series of administrative procedures in laboratory practice; guidelines and procedures for safe and easier performance of the work process, especially regarding proper handling of samples, and thus significantly promoted the knowledge of the employees in the domain of basic professional tasks. 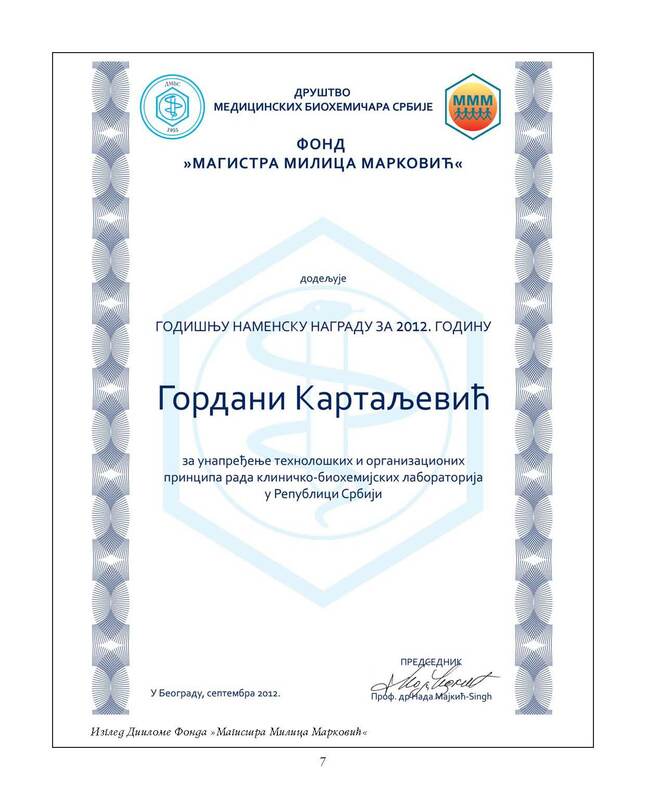 She worked on the continuous education of staff with the goal of improving their professional knowledge and skills, on producing documentation in accordance with good laboratory practice, especially regarding processes that are related to the training of employees in the applicability of guidelines and work procedures and the protection of employees and the environment. She advocated permanent improvement of working conditions in the work place, continuous training in the field of academic advancement and specialization, both of biochemists and laboratory technicians, and systematization of work places with the aim to ensure quality of service. 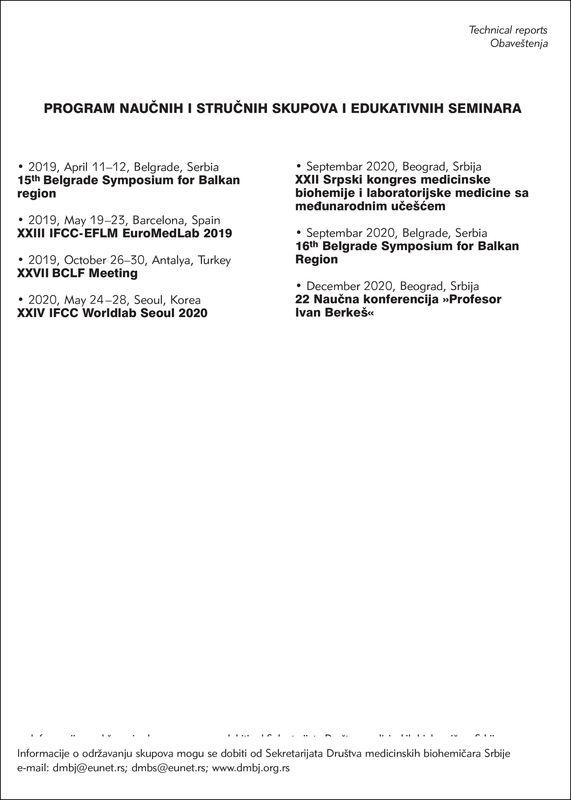 Her laboratory experience became a part of her creative process in the formation of laboratories at the Emergency Center and Polyclinic of the Clinical Center of Serbia. Reception of biological material was seen as a foundation for good organization of a laboratory and further proper handling of samples. 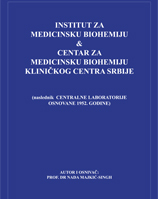 She wrote extensively about it in the chapter Work and Organization of Clinical Biochemistry Laboratory published during her life in the book Nada Majkić-Singh: Medical Biochemistry, 1994 (first edition) and 2006 (second edition), where the technological and organizational work principles of the laboratory were described in practical terms and expressed as a universal organizational form of a laboratory service. 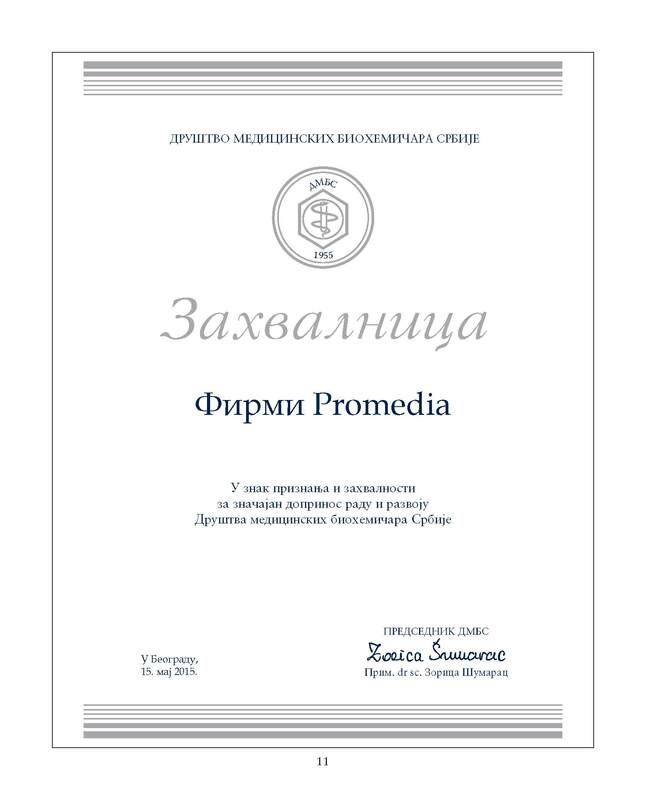 To illustrate the importance of her guidelines, we should say that at least a fifth of the laboratories in Serbia today apply this type of organization. 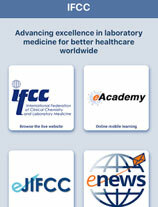 Many, if not most of her suggested instructions and procedures have been translated into laboratory practice. 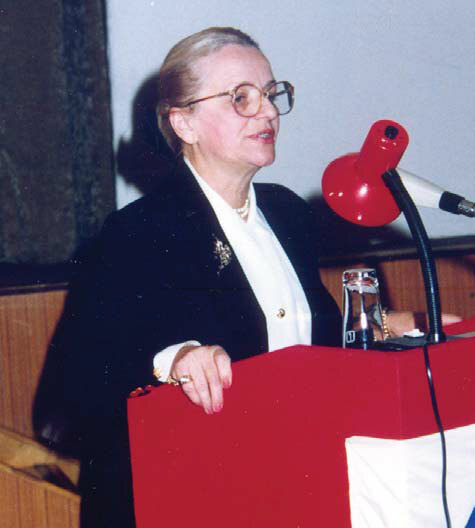 ‘Magistra Milica Marković’ Fund was founded in the memory of Milica Marković, distinguished Magistra of biochemistry, with the intention to continue promoting the goals to which she had dedicated her life. 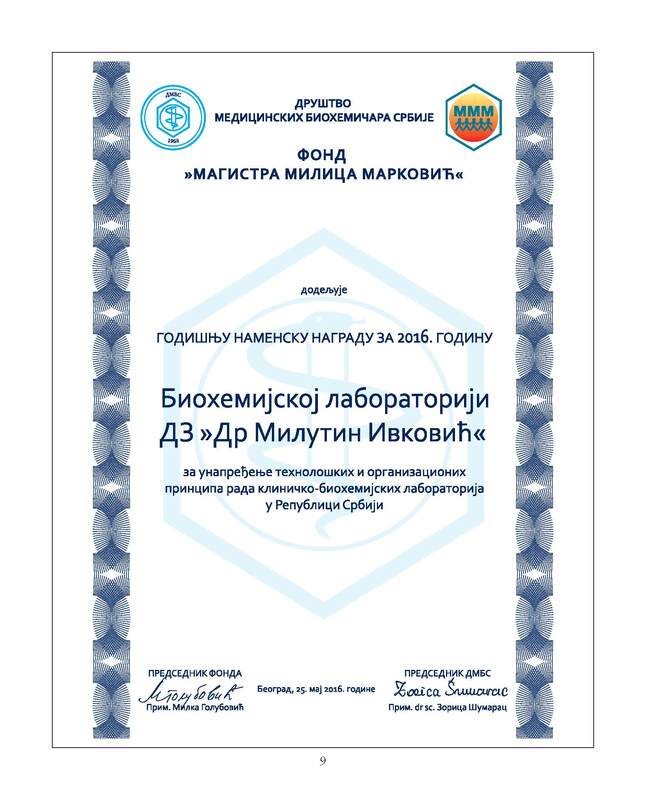 The Fund established an annual reward ‘Magistra Milica Marković’ that is presented to clinical biochemists or laboratories for promoting the technological and organizational work principles of clinical laboratoies, for highly professional engagement of individuals or teams in the field of work and organization of laboratory service with the aim to improve the quality of laboratory services, and for promoting the profession according to Magistra Milica Marković’s recommendations. 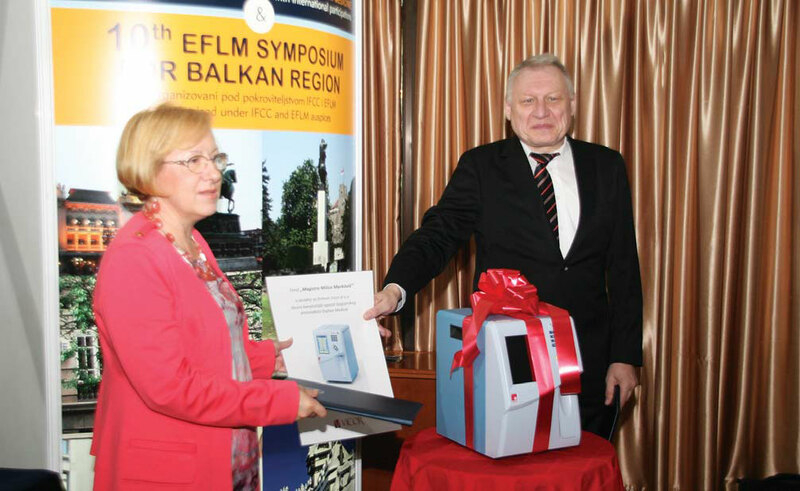 The ‘Magistra Milica Marković’ Fund was first presented on 19 September 2012, at the opening ceremony of the XVIII Congress of Medical Biochemists of Serbia. 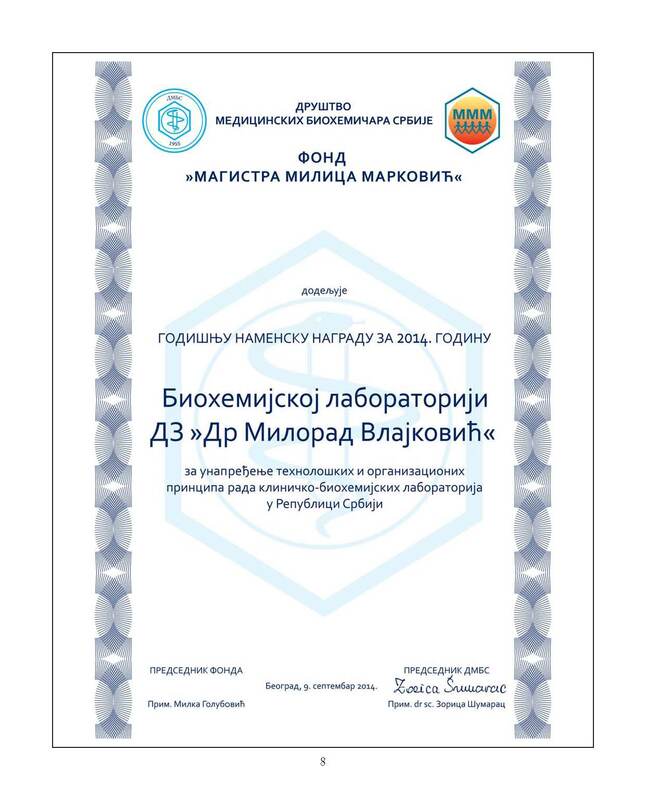 Also for the first time, the Society of Medical Bio chemists of Serbia and ‘Magistra Milica Marković’ Fund awarded Diplomas of the Fund and money rewards to Primarius Milka Golubović and Medical Biochemistry Specialist Gordana Kartaljević, colleagues who were trained as experts and worked under Magistra Milica Marković and who later, owing to the knowledge thus gained, managed two important laboratories at the Clinical Center of Serbia, namely in the Institute of Cardiovascular Diseases and Institute of Digestive Diseases within the Institute of Medical Biochemistry of the Clinical Center of Serbia. 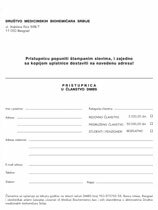 Olga Stefanović predaje nagradu Ivanu Sretenoviću direktoru Doma zdravlja "Barajevo"
Dragana Vučić, Slavica Kalezić Milošević, Milka Golubović, Goran Granić, Zorica Šumarac i Nada Majkić-Singh prilikom uručenja nagrade DZ Palilula.